The worldwide growing interest in traditional medicines, including herbal medicines and herbal dietary supplements, has recently been accompanied by concerns on quality and safety of this type of health care. The content of nutritional and potentially toxic elements in medicinal plants is of paramount interest as it may vary remarkably according to different environmental and ecophysiological factors. 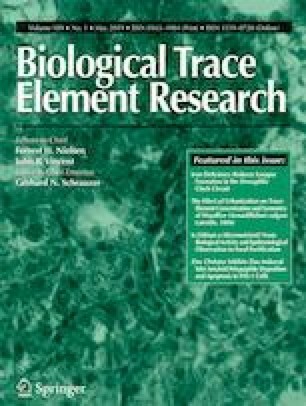 In this study, the concentrations of essential and non-essential trace elements—Co, Cr, Cu, Ni, Sr, and Zn—were determined in the roots and aerial parts of the worldwide distributed and economically important medicinal herb Hypericum perforatum L. (St. John’s wort) and in its growing substrate. Most of the analyzed trace elements varied considerably in the plant parts according to edaphic conditions and soil geochemistry. However, uptake and retention in H. perforatum compartments of Co, Cr, and Ni, which markedly differentiated the investigated soils, were controlled by excluding mechanisms of the plant. Despite this, the Ni concentrations in the aerial parts, commonly used in herbal preparations, of H. perforatum plants from serpentine soils were not insignificant in relation to eventual human consumption. Good practice to assure the herbal product quality of H. perforatum collected from the wild cannot ignore the thorough understanding of the geolithological and geochemical features of the harvesting areas. The authors thank Debora Barbato, Marco Biagioli, Luca Paoli, Neha Shukla, and Andrea Vannini for their useful suggestions and beneficial discussions in the early stage of this study. We are grateful to two anonymous reviewers for their insightful comments on the paper which have substantially improved the final version of the manuscript.